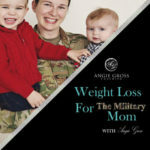 Welcome to the 13th episode Weight Loss For The Military Moms Podcast. Where does self care fit into your schedule? If you said non existent this podcast is exactly what you need. When we take care of ourselves as moms we can take care of our children at a whole new level. Want to lose the baby weight once and for all and pass HT,WT, & PT with ease?!! Join me on a FREE discovery session call here. Also, if you would like to leave an iTunes rating or review for the podcast from your iPhone or iPad follow the instructions below. If you have a PC you can download the podcast app for free on your computer. The same instructions apply.